The giveaway will run from September 8 to September 29. 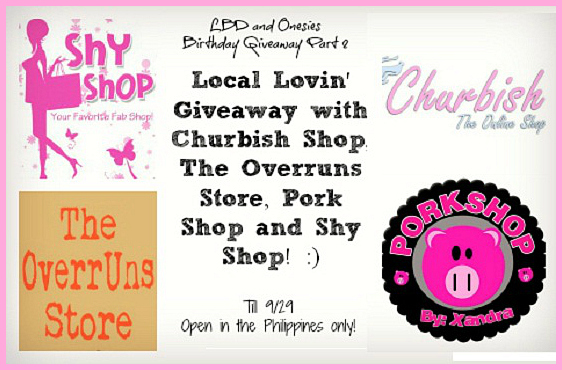 The Overruns Store will ship the prize directly to the winners while the prize from Shy Shop will be handled by me and the prize from Pork Shop and Churbish Shop will be handled by the winner. - Tell me which prize would you like to win. Also, include your email address. Thank you again to the owners of these awesome shops who made this giveaway possible! I want to win the Exclusive Buy 1 Take 1 Promo on Pork Shop's Dresses!!! thanks for these awesome giveaways!!! I'd like to get a free top from the Overruns store. Like this Aztec Kirra Top from The Overruns Store! hope to win! candy wallet from shy shop. tnx. I like to win Aztec Kirra Top from The Overruns Store. I want the Aztec Kirra Top from The Overruns Store or the Candy Slim Wallet from Shy Shop. I would love love love to win the Exclusive Buy 1 Take 1 Promo on Pork Shop's Dresses! I want to win the Candy Slim Wallet from Shy Shop.. I'd like the Aztec Kirra Top from The Overruns Store. I want to win an Aztec Kirra Top from The Overruns Store. I want to win the Aztec Kirra Top from The Overruns Store.